Like all of the functions offered. The price is outstanding. Only complaint is that the instructions for set-up and assembly were a little sketchy. 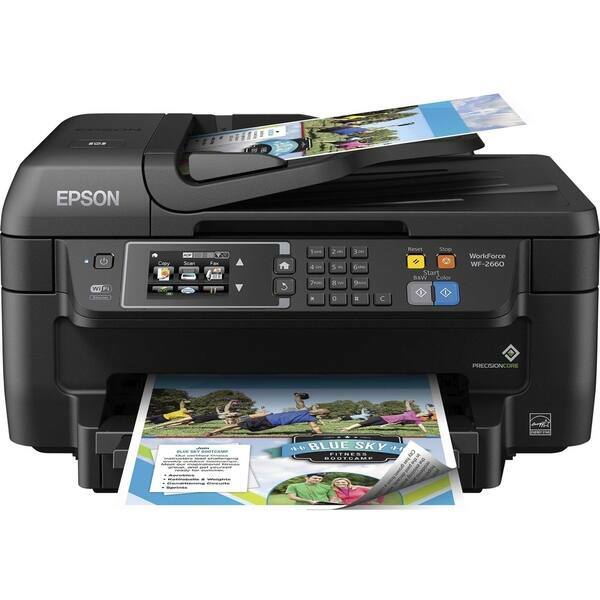 I ordered this Epson WorkForce Inkjet Multifunction Printer and I love it. It is very compatible with various versions and name brand Computer Systems. It is professional and the "print quality, print resolution and number of copies you can print " are exceptional. The price is very reasonable too! I love it! It seems to stop working periodically. Especially when changing cartridges of ink. It somehow doesn't start printing normal right away. Takes many tries and many runs of the cleaning and maintenance cycles before it starts working again. The print quality is OK but not great. This printer is good quality. It is easy to set up. It is a good value. I am very happy I purchased this item. This all-in-one does everything. The only draw back is that is a bit difficult to figure out how to work all of the functions and the directions are a bit vague. Yet with persistence I got it figured out. Used Black ink cartridge pretty fast otherwise a good buy. "Can this printer resize a previously printed document?" Hello Gramma869, yes, that is possible. Thank you for shopping with us! "Is this Windows 10 compatible? Also how fast/how many pages does it print in black & white and color?" Hello iaimport3, yes this is windows 10 compatible and it prints 5.5 color pages per minute. Please let us know if you have any further questions. Needed a printer - last one got smashed in the move across country. Ugh. We have always used Dell products but their customer service is annoying me lately, I'm not much of an HP fan and this had good reviews, so I'm going to try it. "Does it print on CD/DVD ?" Hello ababeicostel, this printer does not print onto a CD or DVD, however, you can print onto a sticker to put on a CD or DVD. Thank you for shopping with us! "Is it facebook and internet ready and download from smart phone, also is it wireless"
Hello liwhit50, yes, this is wireless. Thanks for shopping with us! "Is it a Fax to?" Hello Mcgyver, this item is able to fax as well. Thank you for shopping with us.